Sundays Sun Spa Shop members know our twenty locations around Hampton Roads have the best indoor tanning lotions in the area. 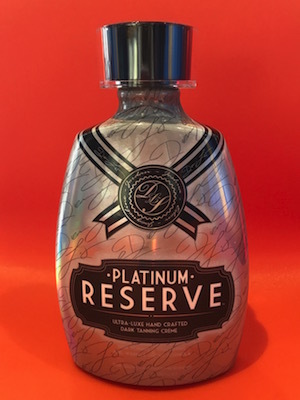 We are home to Dennis Ligon’s own Signature line of lotions and moisturizers, and this week there’s a new addition to the family: Platinum Reserve. If you haven’t gotten your own bottle of Platinum Reserve, you’re missing out! We are proud to announce for a LIMITED TIME only you can get it at a special, discounted launch price. Come to any of our salons for details. This lotion offers the highest level of skin care ingredients, providing users with hydrating tanning butter, powerful anti-aging and skin firming benefits, and fine line and wrinkle reducing elements, with an amazing prosecco fragrance. This is the creme de la creme of all tanning lotions. It will leave your skin feeling soft, hydrated and sun-kissed. While it offers hydration, anti-aging, skin firming, fine line and wrinkle benefits, Platinum Reserve also provides a rich source of calcium and vitamins to help reduce environmental stress and damage, tattoo and color fade protectors, and it helps eliminate that after tan odor. Come to Sundays Sun Spa Shop to pick up your own Platinum Reserve tanning lotion at a discounted price! All members will also receive their membership discount with purchase.